Casa Hortencias, the home that started this amazing vacation rental business. This wonderuful Mexican Style home was purchased in 1999 and has hosted thousands of happy guests over the years. The home has three bedrooms and three baths, an open floor plan with kitchen and living/dining spaces and a relaxing terrace off of the living room and master bedroom. Then walk up the the amazing rooftop terrace and experience paradise on the hill above Puerto Vallarta and The Bay of Banderas. Private pool, BBQ, dining tables, lounge seating in the shade and the sun, make this a magical spot for your vacation. Imagine dinner on the rooftop as the sun sets prepared by Chef Maria. Imagine your morning coffee as the sun comes up watching nature all around you. Don't imagine, experience! Make your plans now to and await your experience at Casa Hortencias in Puerto Vallarta. Puerto Vallarta is an amazing town. Make sure you stay in the 'real' Puerto Vallarta in Old Town/Romantic Zone. Here you will experience the real charm of Mexico. Old Town is where those who love Puerto Vallarta return each year. Old Town is a great mix of open minding fun interesting people. It's where straight and gay, young and old, black, white and brown, all mix to create a fun and festive environment. This area has a huge variety of restaurants. There is something for everyone. If you love people watching and meeting all kinds of people, this is the place. The private roof top terrace at Casa Hortencias is the perfect spot for your afternoon pool time and even better for your evening happy hour. By being on the hill you get the great ocean breezes and avoid all the loud noise of downtown throughout the night. The home has amazing views, wonderful furnishings and everything you need to experience Puerto Vallarta as though it was your own home. It's just a great home. Casa Hortencias has been renting for 14 years now and it only gets better each year. Great property. I went with a group of friends and we just wanted to relax. This was the perfect home for us. The pool is on the rooftop with very nice views. We went to the beach a couple of times but found hanging at the pool was so easy and relaxing. What a lovely home. The views are as promised and the home has a wonderfully styled interior. The home is very comfortable with a large seating area downstairs both inside and out and lovely lounges and chairs on the rooftop pool area. The house was perfect for 3 couples with plenty of spaces so that everybody was able to find a place to relax. The pool has sun for about 3 hours but the surrounding patios are beautifully shaded with lush vegetation perfect for reading that book. We highly recommend getting the pick-up from the airport...just takes all the challenge out of your stay. The beds are all very comfortable and the linens are quite nice with plenty of thick towels. We usually run down to P.V. every couple of months for a few days and this was the first time that we have rented a house. We usually get a Hotel on the beach. That being said we liked the house location up on the hill...it was just a little challenging walking down to dinner in town. The "tire" trail is treacherous in the light of day and only with proper shoes, I do not recommend this path by night. The streets are very negotiable just plan the time. For me on the the biggest perks of staying here is the close proximity to my favorite restaurant in P.V. Vista Grill. I would have eaten there every night. Four of us shared the home and absolutely loved the fact that there were so many different spaces to relax in. The housekeeper did a spotless job (and as someone also pointed out, if you don't want her to do your laundry, don't leave it out and visible!) . The kitchen is well equipped and easy to cook in.The walk down the tire path was very daunting the first day, but by day 2 it was a snap. We love PV, and prefer to spend time in Old Town, so this was perfect. The only downside is how close condos are all around it. We were fortunate that most were empty, so there was little noise except for one night when neighbors had a loud party..No big deal. Loved the roof top pool- fabulous. Would definitely come back. July 29 I arrived at Casa Hortencia....and my "mexican family" arrived early the next day. From the moment we entered this house, we felt "at home." Beautifully decorated. Mexican style but not "over the top." Modern kitchen with everything one needs to cook! Stainless steal appliances, granite, and high end pots/pans. Washer and dryer in the house and much needed! I can't tell you how beautiful the view is. I miss it already! Overlooking the bay-spectacular at night and in the daytime. Feels like you are in the jungle with natural sounds all night long. Parrots, etc visiting you on the veranda-not to mention iguanas (harmless). The staff is excellent, and not "in the way." The owner ensures that everything is done right and the staff are respectful and eager to please. This is a home, not a house. Loving touches everywhere. This was the first time I rented a house (vs hotel) and it was a great choice. I plan to return again, in the very near future. I brought my small dog Lola and she thoroughly felt at home. There is plently fo space, all the comforts of home - more towels than you can ever use! I could go on and on, but it was a RELAXING and memorable vacation for everyone. I would highly recommend a stay here. Jeffrey and staff were accommodating, professional and friendly. 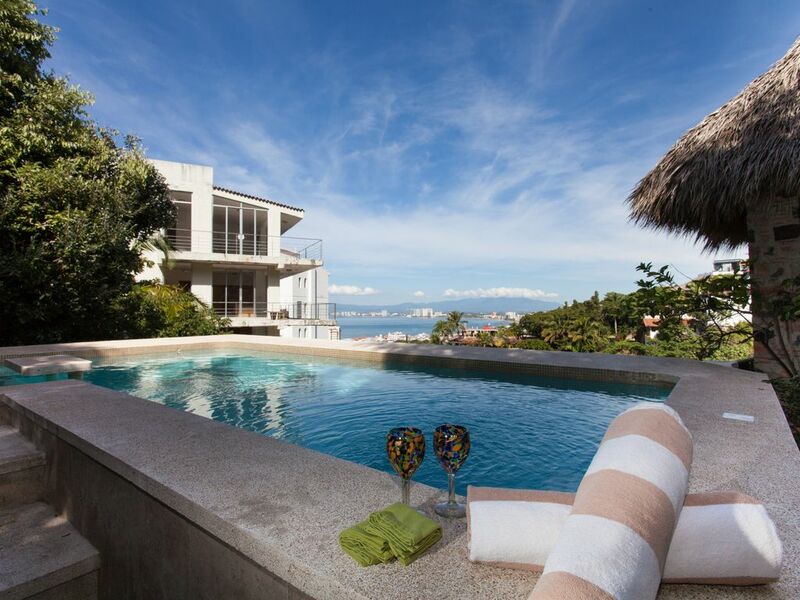 Casa Hortensias was charming with beautiful views of Puerto Vallarta. I would recommend this property to guests that enjoy a quiet retreat away from the hustle and bustle of downtown yet close enough to walk or taxi to all the lovely "to-do's" Puerto Vallarta has to offer. We got a tour of Casa Romantico - 2bd 2 ba (Jeffrey's other property); it is beautiful!